Yo-yo dieting is a very real concept, a very real diet trap and it keeps millions of us unhappy and pre-occupied and, well, generally missing the point of life. As each new commercial dieting program comes to us (Dukan, Atkins, Weight Watchers, Slimming World, Cabbage Soup, High-fibre, Low-fat, Zone, the list is endless), we sincerely believe it will make a difference to our mal-nourished bodies. And we try again for weight loss. 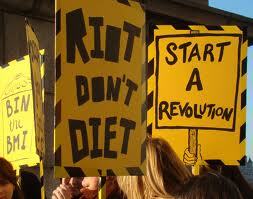 What we forget, time and again, is that diets don’t work. At best, they are always a short term solution: most of us can lose weight if we set our minds to it but how many of us manage to sustain the weight loss? Short term gratifications (new clothes, new shoes, new hair cut, new man, new party) seduce us down the diet path but what is it that you want, long term? If your long term wish is to be free to live life fully, to enjoy each day without waking up and venturing into battle with your self, to be “normal” around food and to understand food and the response it can trigger in our bodies then take a little education. For example, learn about the relationship of sugar and insulin and the response it has on your body. Further reading here on exactly how our modern diet is fuelling the obesity epidemic and try this excellent item Bad Fat - Good Fat to open your eyes to thebenefits of eating saturated fat in our diet. Challenge your current behaviours, think Human Shaped! Be radical. Eat bacon. Stand up, stretch and take a look around. If you keep doing what you’ve always done you will continue to get what you’ve always got. Do your reading, do your critical thinking, experiment and make good choices. Every day what you do defines who you are. Get a few recipes under your belt, understand what you can and can’t eat for optimal health , use our ancestors as your point of reference (did they eat it, would they recognise it as food) and never ever forget the fact that it is the food that is making you fat NOT some lack of will power or failing in you. It is the food that causes addictions and triggers behavioural responses such as overeating. Not you. It is a biochemical response. Chemistry. Not you. Clean up your diet and the bio-chemical reactions go, the behavior triggers go and now you have a fighting chance to achieve those long term goals. Weight Watchers, Slimming World, Rosemary Conley are you going there because you truly believe you can achieve sustainable effortless weight loss? Or do you secretly harbour doubt? I really don't know that one diet lifestyle works for everyone. I read your blog with a lot of interest and learn quite a bit. However I can't eat like you do. First I am not really sure what to eat. I can't do a fatty foods, they make me ill. The smell of eggs cooking turns my stomach, and nuts and seeds are a definite no no. I have lost almost 20 lbs since the beginning of the year and I am good with the weight I am at. I am trying to keep it to real food and little to no processed, but it is not easy when there is no time or money. I am getting very bored with the food I am eating. These are the jokers who push grain, do not know that the correlation between high serum cholesterol and High Fructose Corn Syrup is tighter than it is with saturated fats or eating cholesterol (e.g. crustaceans), and that a breakfast starts with Kellog's or General Mills mostly-sugar cereals. And if WE offer readers sound, healthy advice, WE are the bad guys???? Be wary of well-meaning, nice-sounding government encroachment into our lives. Absolutely absurd! Thankfully, Arizona has no such useless licensing board. Fortunately we do not reside, practice, promote or charge any fees in the USA, thank goodness! Fortunately we only have a UK client base and would never promote ourselves as dieticians as it's dieticians that got us in the mess we're in today. I have lost a stone on slimming world- after seeing my sister lose 3 stone (she's at nearly 4 now). I had tried other things on my own, and my diet wasn't full of processed or fried foods. However, I was over eating, eating too much fat, sugar, bread. To be fair, I love baking bread. You're missing one VERY important point about the commercial diets you're debasing: The social proof and support of *paying* and *attending* and getting a consistent method of feedback. Yes, I had apps, and used forums - but real men and women in your community cannot be matched online. I read a great book Willpower Instinct that helped me quit smoking last year- and the same research backs up why these methods work. In essence, we know physically the only way you can lose weight is to lessen the amount of calories you consume to what you burn. However, changing your relationship to food is not cut and dried for many people. I agree nutritionally, that weight watchers ready meals are NOT a healthy solution, and don't fix the underlying problem. 1- Eat 1/3 minimum "superfree" at mealtimes and when snacking. Superfree = veg and fruit. This naturally limits your ability to eat non-veg stuffs. 2- You can eat Low-gi grains, rice, quiona, etc freely; as well as beans, lean meat (fat cut off). 3- Get a portion of 'Healthy extras' which ensure you're getting fibre/calcium, etc. 4- Count anything that is calorie-dense, such as fats, oils, sugars. And limit those to 100-300 calories a day. (Counted as "syns"). 5 -And finally: Just eat until you're full and stop. Basically- it sounds like 'common sense', but it helps you slowly retrain your relationship with food. I think slimming world is effective because of the psychology behind it - as much as the ease of meal planning.